The Wet Tropics is as much about water as anything else, as it is partly what defines us as different from the rest of Australia. Everyone who lives in the Wet Tropics knows that the rainfall in the tropics is enormously variable and is affected by many natural forces including the El Niño Southern Oscillation.Scientists from James Cook University and CSIRO have worked with Regional NRM groups to carefully consider the likely impacts of climate change on freshwater availability and freshwater ecosystems in the region. They have also considered actions to help the region adapt and cope with these impacting climate changes. Due to the enormous variation and uncertainty of climate change, it is difficult to anticipate the very specific impacts of climate change on rainfall and the availability of fresh water in the Wet Tropics. Because of a large variation in what the 46 Global Climate Models say for tropical areas, we cannot be confident about exactly how annual or seasonal rainfall patterns will change in this region. However, we can expect that rainfall will be less predictable and that major rainfall events are likely to be more intense. It is also likely that water-use practices based on our past experiences of rainfall patterns in the Wet Tropics will need to be reconsidered. What we can conclude with confidence is that there will be substantial impacts on fresh water ecosystems. A combination of increasing water temperatures, more intense flooding, salt water inundation of coastal waterways, sea level rise and increasing storm surges will all have an impact. Despite this, the Wet Tropics region is expected to retain a large proportion of its freshwater biodiversity under climate change scenarios, making it very important for the conservation of freshwater systems at the national scale. Despite uncertainty in future rainfall levels, there is a high level of confidence we will experience more evaporation which will mean less water in dams, irrigation channels and crops. This has implications for town and agricultural water supplies in the Wet Tropics region even if rainfall continues to be higher than other areas of the country. As a result, increased evaporation of moisture from crops and pastures during the drier times of year will lead to an increased need for irrigation water, at a time when there is less water available in dams and lakes. The production of hydro-electric power from Barron Falls may also be impacted by these changes. Cyclones also impact freshwater availability by causing damage to water distribution infrastructure and interrupting power supplies. This damage is more frequent and covers a larger area when cyclones are more intense, also leading to flooding within the region. Flooding will potentially affect fresh water availability by contaminating water supply through increased runoff of soil and pollutants into waterways and dams, as well as through flooding of low-lying sewerage and other waste facilities. More frequent and widespread contamination of water will affect town, agricultural and industrial supplies, as well as the longer-term health of freshwater systems. With more intense heavy rainfall events, farm and municipal dams are more likely to fail, exacerbating downstream flooding and also reducing water storage capacity after the event, which increases costs associated with supplying water. Similarly, pumps, pipes and other water distribution infrastructure will risk more frequent damage. Sea level rise will have the highest impacts on fresh water availability in coastal areas where wetlands, lakes and dams may be flooded by rising ocean water. In some low-lying areas, inundation will be permanent, while other areas that are currently situated just above high tide levels will only be inundated on high tides or storm tides. The risk of sea water inundation in these areas will be worsened by more intense cyclones which are likely to increase erosion of sand dunes and damage mangroves and other natural barriers which separate ocean and freshwater habitats. Freshwater supply in coastal areas is also at risk from saltwater intrusion entering into groundwater, as a result of the shifting balance of fresh and saltwater in coastal groundwater aquifers (Figure 1, below). These processes of saltwater intrusion into coastal groundwater may result in the bore water turning salty. Extensive areas of the Wet Tropics coastal plain which are currently under sugar cane cultivation are at risk of being impacted by the salination of groundwater. Figure 1. Depicts saline intrusion as a result of sea level rise, showing (a) a hypothetical coastal aquifer under current conditions and (b) the same aquifer under a scenario of higher sea level. The consequences for groundwater extraction are shown for a hypothetical well/bore. Read more about saline intrusion. Higher sea levels also bring the risk of increased tidal penetration, that is, the movement of saltwater further upstream than is currently the case. Increased tidal penetration will reduce the availability of freshwater for extraction from waterways and directly affect agriculture on surrounding land. An example of this is through high tide inundation or during flood events. Increased tidal penetration risks increasing corrosion of pumps, pipes and other water distribution infrastructure and these risks will also be exacerbated during storm tides associated with cyclones. What can be done to adapt to the climate change impacts on water? It will be increasingly critical to keep track of actual changes in rainfall over time as this will help determine how to adjust patterns of water storage and use. It is very likely that certain land management practices will play a crucial role in protecting the supply of fresh water. For example, revegetation, especially along watercourses, may help keep waterways cooler and reduce the effects of soil erosion. Revegetation is also likely to be important in facilitating the landward shift of coastal systems with sea level rise. Innovative technology for minimising evaporation from water storage systems will become increasingly important and cost effective. Now more than ever, water use efficiency and water recycling is important because water is a precious resource and we can no longer take it for granted in the Wet Tropics. The impacts of climate change on sea level rise should be a primary consideration in all planning processes. 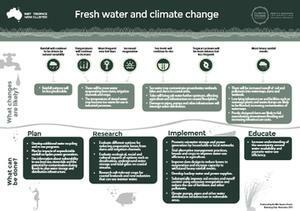 A project known as Adapt NRM has developed information about planning and managing biodiversity – including freshwater ecosystems – under climate change in Australia. This information includes discussion of new principles for biodiversity management, as well as maps and other resources.